Minerva will help people in the kitchen in the process of cooking. 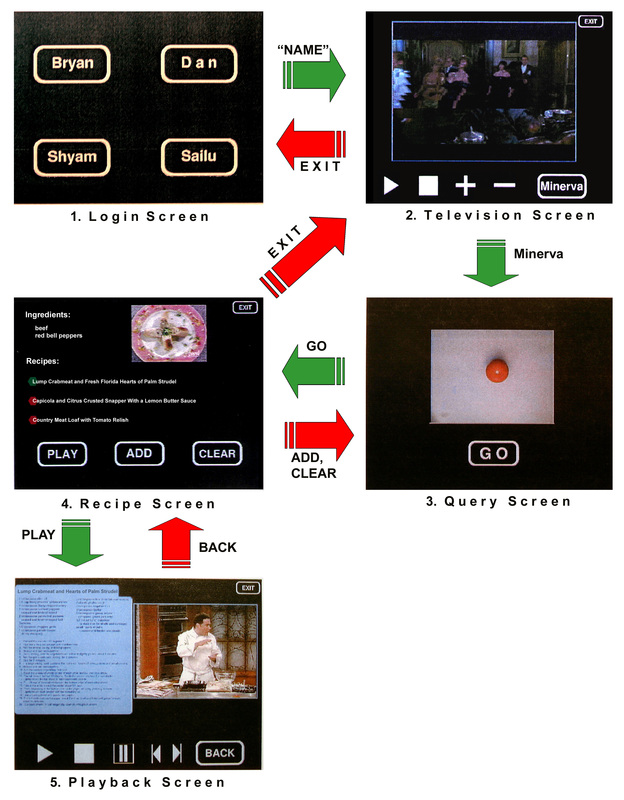 The system looks at the ingredients that people place on the counter, recognizes them, and retrieves appropriate video to be played from a database. As an example, the person might put down eggplants and noodles on the counter. The system, on a video display near the counter, will recognise these items and start playing a cooking show for the recipe "Spicy eggplant chowmein". Involved during selection of the video and subsequent playback are various contextual factors, including viewer preferences, history and current activity state that change the manner in which the video is played back. The overall goal is to create a video assistant, that reduces conscious user interaction and increases relevant assistance provided for his/her activity, without interfering in their activity. One can imagine extending this beyond the kitchen, to other environments where the person'sactivity can be monitored and relevant assistance provided.